Here's the deal. I am in love with these women and in love with their boutique. I came to The White Room when I did my wedding dress shopping and knew it would be my only stop on the wedding dress excursion. 6 dresses in and I was in tears (literally) because I found the dress that felt just like me. Not only did they have a dress selection made of a girls dreams, but Anne and Carmen meet you at the door with open arms, hand you a glass of bubbles and make every minute of your experience unforgettable and like you just made a new best friend. My obvious first question...Give us a little bit of background on The White Room and you two fine ladies! ...with a little heart, soul and a fateful introduction. Anne and Carmen met as co-workers several years ago and immediately connected. These days? It's like we're family. We are not only passionate and spirited about each other, but we find importance in connecting with others and sharing our heart and passion with the world. Before this kismet adventure began, Carmen was designing custom wedding dresses and performing alterations out of her studio and Anne was working in event planning and exploring the ever evolving world of fashion & design. Through those experiences, we both saw a need in the Twin Cities for a wedding dress shop that provided unique, fashion-forward gowns as well as an intimate, low-stress experience. We wanted to create an environment where ALL brides would feel welcome and relaxed while searching for "the dress" and to inspire women to celebrate their own confidence and personal style. And with that (and a little grit and good fortune), The White Room was born! How would you describe a White Room bride? How in the world do you decide what dresses get to come into the shop for brides to choose from? This is one of the most challenging parts of running a bridal shop! We are constantly learning every day about what our brides are looking for in a wedding gown while trying to maintain our modern and forward thinking brand. Every year we go to NYBFW in NYC where our weekends are packed full with runway shows, presentations and designer meetings. We then take this knowledge back home and try to fill in the gaps of our current collection while remaining on trend. We definitely love our smaller, up and coming designers. They are the ones who create a new, fresh vision of what bridal can be! What is the best part about being in the wedding dress world? Definitely making a bride’s experience one she will never forget! The pinnacle of our business is to ensure every bride that walks in our door feel valued, confident and beautiful. As if she (and her family) are the only ones in the showroom, having the most amazing and memorable experience. What are some trends you are seeing when it comes to 2018/2019 wedding dresses and what brides are looking for? We are definitely seeing a lot of plunging necklines, sheer overskirt options and A-line skirts. In NYC last fall, 3-d lace, and appliqués were trending and we look forward to seeing what’s trending during spring market this year. Long trains and low backs are always a common request that will probably be sticking around for the long haul. What are your top suggestions for brides to know before they come in to shop for a dress? 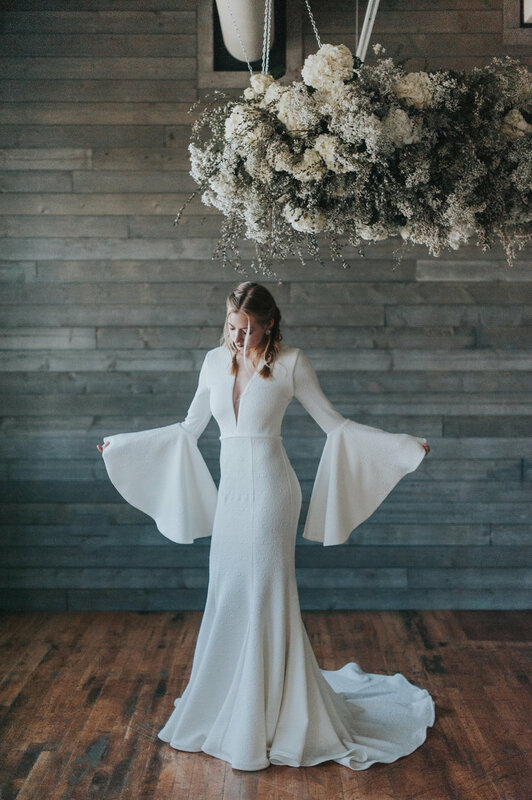 In terms of fit, everyone is very different, what are the key recommendations you have when brides are finding that dream dress that makes them feel like a million bucks, but also allows them to be comfortable in their dress on their wedding day? What are some top trends you are seeing in the accessory department? Brides seem to be on two different sides of the spectrum - minimal accessories or blinged out to the max! TWR brides tend to be a bit more minimal, looking for one heirloom piece (such as a great veil) and/or simple jewelry. How would you describe the perfect gown for a TWR bride? Anything that makes you feel confident, fierce and like yourself! What does the process of buying a wedding dress look like? What should brides expect and plan as they shop for the dress of their dreams? Give yourself at least 10-12 months to shop for your dress. It typically takes about 6 months for your dress to come in and alterations are almost always necessary, which can take up to 3 months to complete depending on the season you are getting married in. Be open to different styles! Sometimes a dress can look completely different on the hanger and may just end up being your dream dress. Trust your gut and trust your stylist - these are two key components in finding the one! Besides gorgeous dresses, are there any other services you offer? 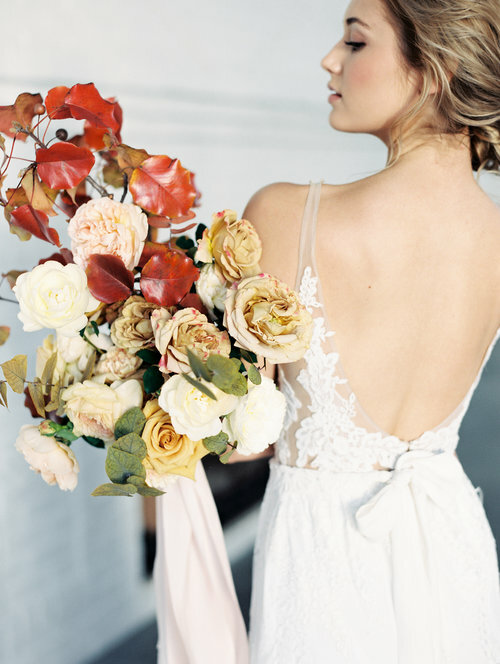 We are a full-service bridal studio, which means we also offer in-studio alterations. A huge perk! And let’s not forget complimentary bubbly and lots of hugs! Is there anything else you want us to know about The White Room? We love all things food and talking about it! Seriously, it’s a problem!